A father came home from a long business trip to find his son riding a very fancy new 10 speed bike. 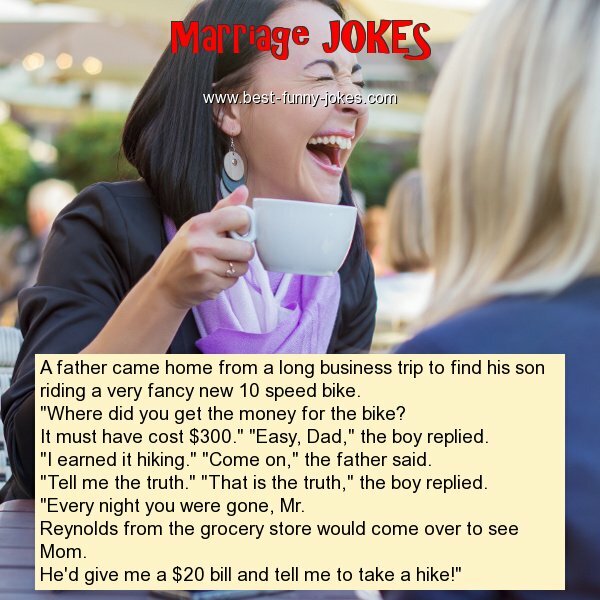 "Where did you get the money for the bike? It must have cost $300." "Easy, Dad," the boy replied. "I earned it hiking." "Come on," the father said. "Tell me the truth." "That is the truth," the boy replied. "Every night you were gone, Mr.
Reynolds from the grocery store would come over to see Mom. He'd give me a $20 bill and tell me to take a hike!"